Languedoc Roussillon represents Miles of fine sandy beaches, a hinterland rising up the foothills of the Massif Central and the Pyrénées – Languedoc-Roussillon is a land of sun-filled charm. Chateau, Villarzel-Cabardès holiday homes Accommodation. There is 1 person looking at these apartments. 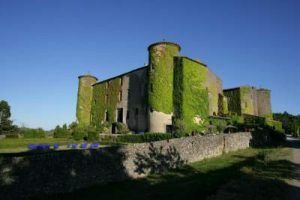 Set in Villarzel-Cabardès, Château de Villarlong is a castle sitting in a 100-hectares park with a chapel dating back to the 9th-century. More It offers an infinity pool, a tennis court and 7-hectare vineyards. The self-catering apartment s and villas have exposed-stone walls and wooden beams. All apartment have either a large terrace or private garden, an open fireplace in the living room and views of the château’s grounds. They all have a fully equipped kitchen. A continental breakfast can be prepared upon prior request. Guests can also sample Mediterranean dishes served at the restaurant. Free Wi-Fi and free private parking are provided. Canal du Midi is 5 km away and Carcassonne is just 10 km away. Guests can drive 5km to visit Cathar Castles. Carcassonne Train Station is 15 km away, while Carcassonne Airport is 10 km away. Set in the Languedoc-Roussillon countryside, this hotel is a 2-minute drive from the town of Uzès. It features an outdoor swimming pool with a solarium and a flowery patio on the first floor. Air-conditioned guest rooms are equipped with a TV with satellite channels and free Wi-Fi access. Each soundproofed room at Patio de Violette features a balcony overlooking the patio. All rooms have a private bathroom with a hairdryer. With free private parking on site, the hotel is 8 km from the famous Gard Bridge. The Haribo Museum is a 5-minute drive from the property and a free shuttle service is available on Wednesday and Saturday. 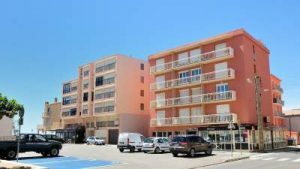 Valras Plage is a self-catering accommodation located in Valras-Plage. The property is 50 metres from the beach. Accommodation will also provide you with a TV and a balcony. There is a full a kitchenette with a microwave and a refrigerator. Featuring a shower, private bathrooms also come with a hairdryer. You can enjoy sea view and city view. Montpellier Mediterranee Airport is located 81.1 km away. Take A Break Holidays takeabreakholidays, Languedoc Roussillon Accommodation.